Arcam goes multiroom with eight- and twelve-channel custom installation power amplifiers | What Hi-Fi? Instead, the eight-channel MZ8 and twelve-channel MZ12, set to sell for £1600 and £2000 respectively, are said to be all about delivering Arcam sound quality into a number of rooms at the same time, while being hidden away in an equipment rack. 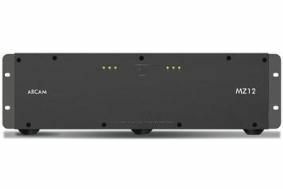 The new models are described as 'audiophile grade custom install amplifiers', and deliver 65W per channel, with separate gain adjustment on each channel. Each zone served can be set to 'clone' the Zone 1 input, reducing patch-cabling. There's also 12V trigger and RS232 control, and a provision for individual zone muting via RS232, and the amps have massive heatsinking, status LEDs for each zone, temperature-controlled fan cooling and over-current and over-temperature protection. The amplifiers are built with a large toroidal transformer, plus separate rectification and smoothing, for each block of four channels, and use multiple high-quality capacitors for stable operation under load. Detachable 19in rack-mount 'ears' and feet are provided, and the new amps are designed to consume just 1W in standby.